wrenavery wrote: I adore this game, but I'm stuck. I found the frog drawing above the painting but it won't let me take it so I can't go any further than the lily pads. Is it because I have Windows 7? Which painting? I can't find the Frog so I can't proceed in the Children's Room. Help! New to the forum... I am stuck. I am trying to enter the shop in the town and i can't hang the lantern on the hook above the window. It took me a few goes to get the lantern hanging too, don't worry ! First, be sure to zoom into the window scene. 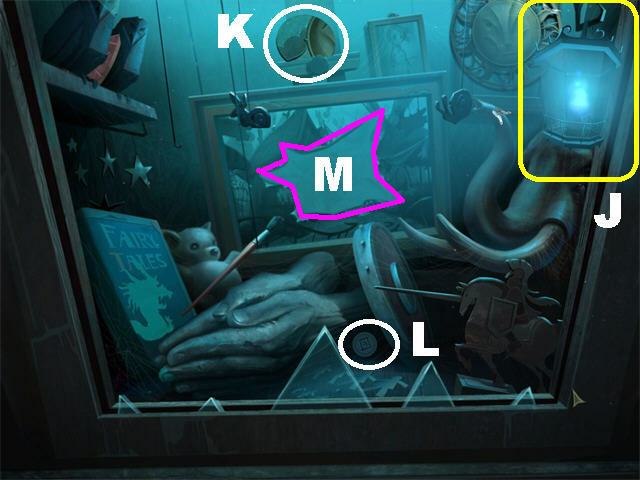 The hook is on the right hand side, the screenshot here illustrates exactly where. Once you've acquired the blue lantern, pick it up from your inventory and click approximately on the middle part of the hook (I got it on my third go). You can also try turning off fullscreen mode temporarily as this has worked for some fishies. If after a few clicks it still refuses to stay put, you can also try updates or disabling Aero if you are under Vista or 7. Sometimes this helps. I can also suggest contacting Customer Support by clicking on the green envelope on the right to get to our Help pages, and then click "Contact Us" to the left of the screen to submit a support ticket. We definitely want you to be able to play your game! Are you talking about the frog in the painting in the children's wing? He's kind of small and blends into the background. I don't remember the exact spot, but it is on the right side of the painting. Just concentrate there and move your cursor very slowly until it changes indicating you can pick something up. Your first post is in the Standard Edition forum, where I answered you. This is the CE forum. Sorry and thank you - I didn't realise at the time that i wrote the first question that there were specific forums for each individual version of the game - first time I've ever looked at forums. I'll go find the answer you gave to my question elsewhere. Cheers. I really enjoyed the first one and simply had to buy this one - never had a collector's edition before! Unfortunately, I have downloaded this game three times (the latest time just today) and cannot get it to work. The screen is just covered in blank boxes with little boxes floating in and out and I cannot see any writing or where to click to start playing! Looking at other posts, it doesn't seem to be the game that is faulty as others are playing it, so what is wrong with my pc? Help - it's driving me nuts! Musicchick wrote: I really enjoyed the first one and simply had to buy this one - never had a collector's edition before! Unfortunately, I have downloaded this game three times (the latest time just today) and cannot get it to work. The screen is just covered in blank boxes with little boxes floating in and out and I cannot see any writing or where to click to start playing! Looking at other posts, it doesn't seem to be the game that is faulty as others are playing it, so what is wrong with my pc? Help - it's driving me nuts! It's probably your graphics driver or chipset if you're playing on a laptop. BFG CS can help you with that. Click on the green envelope, then the Contact Us hyperlink, then select Technical Issues from the drop-down list. Excellent Game, can't wait for the sequel. Simply awesome. Quite challenging in play but the advice and a couple hints always got me to a place where I could proceed. A lot of patience and perseverance is required on some of the puzzles. I had to skip two ... the candles and the rotating disc ... but spent hours on painting the queen's face and was excited to finally get it done. There is nothing unfair about this game, it's hard, but not unfair. Even the final extra challenge of saving the butler -- I was sure I'd never find all the pieces but I did (the advice is good without giving everything away). Plus, of course, the excellent visuals, plot, and design. I really liked that the moral is about hope and imagination ... you need both to complete this game, and we all could use more hope and imagination!!! So much more positive than some of the spooky or gruesome games, fun as those are too. Thanks Big Fish -- and all your designers and artists. I loved the first one and really enjoy this game, too. But where the heck is the second tower? I am stuck. I'm stuck at the eye of the idol. I got the 3 symbols from the scroll at the end of he hall and have put the symbols onto the eye. I can get 2 of the symbols lit up but when I get the third symbol lined up in the red circle it just flashes and the symbol doesn't light up. What am I doing wrong ? The first thing I would recommend would be to uninstall and reinstall your game from your Purchase History. If you continue to experience difficulties, I can also suggest contacting Customer Support by clicking on the green envelope on the right to get to our Help pages, and then click "Contact Us" to the right of the screen to submit a support ticket. I so love this game, I played it and played it several times over on my old laptop and have just replayed it on my new notebook with Win7. Stunning, loved doing the puzzles, and getting all the achievements again and will definitely be getting Drawn 3: (Whatever they call it). The music, the artwork, the artists voices. All make for a wonderful experience in gaming. I do hope they have the same people to do any voices in number 3. I just can't praise it high enough. Where is the blue light lantern in the alley??? I can't find it. Please, help me!!!!!!!! I am stunding at this level.